You may have noticed that you throw away a lot of stems, roots, seeds and other scraps when you prepare food. 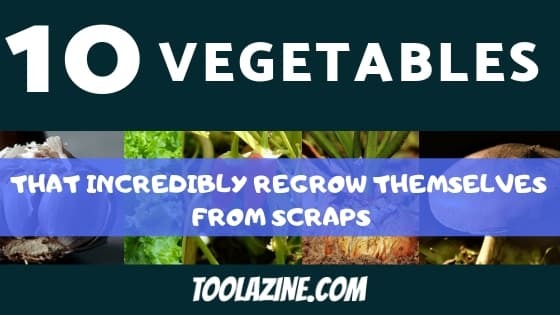 Well, some may not know this, but you can regrow your vegetables with scraps you normally get rid of. This is also a great way to spend less money on vegetables! Also, if you love gardening this is a fun and convenient way to spend your time. Like what you see? Please consider sharing this on Pinterest. Lettuce is probably the easiest to regrow. All you have to do is cut about 2 inches of the stem, and then place it in a tray with very little water in a sunny location. Just remember to change the water everyday. After a few days you will start seeing the roots growing and you can then replant it in soil. The best part is that it regrows very fast! It only takes about 10 to 12 days until it’s regrown! Regrowing avocados is a little bit more trickier. For starters you have to wash the seed very carefully so you don’t remove the brown skin around the seed. You’re going to want to use a jar or cup for this next step, get 4 toothpicks and put three around the middle of the seed and the last one at the bottom. This will help the seed stay put on the cup. Make sure the cup is filled so it only covers about an inch of the seed. It takes a couple of weeks for the roots to grow and it will eventually grows leaves. When your avocado reaches that point you can transplant it into soil. It takes a little more attention (and patience) to regrow avocados but it’s an enjoyable process. Potatoes are very easy to grow. If you have potatoes with eyes (the little stems) and aren’t comfortable eating them you can definitely choose those for planting. Although it’s completely safe to eat potatoes with eyes, some people choose not to. You can cut the potato into chunks (make sure to leave the stems), and then let them dry overnight. These potato pieces can go straight into the soil. Remember to give them a bit of space when planting them and to keep the stem facing up. Pro Tip: keep the soil moist for best results. You’ll know they’re ready to harvest when the potato plant dies, sometimes the plant flowers so make sure you harvest the potatoes after. Ginger is very easy to grow. All you have to do is keep a piece of it with the skin on. Just like the potatoes, ginger also comes with eyes. When planting it put the piece of ginger in soil and keep the eye facing up. The plant should have a good amount of sunlight and you should spray it with water everyday to keep the soil moist. Keep in mind that ginger takes a couple of months to grow (3-4 months). Regrowing garlic is quite similar to regrowing ginger. Take one clove and put it in a cup with a little bit water. If the clove starts growing a green stem, wait a day then move it into soil. Plant the clove so only the stem is visible. You should water it 2 times a week to keep the soil moist. You will know it’s ready when the plant starts to change color and eventually dies. Onions are simple to grow, you cut off the top piece you normally throw away and keep it in an open space to allow it to dry for a couple of days. After it’s fully dried, transplant the onion in a pot of soil. If you want green onions, you can put it in a water container as soon as it starts growing roots, the green will continue growing and you can cut what you need and leave it growing. For fully developed onions you should transplant it to a larger area so the roots can grow freely. You can grow mushrooms by cutting off the stem and it will grow a new head. I recommend you plant it in a pot because it’s much easier to control the temperature. Mushrooms need to be a in a moist and warm environment. It usually takes about 3 to 4 weeks for the mushroom to be ready for harvest. Peppers are fairly easy to regrow. Instead of throwing away the seeds just put them aside. When you choose where you want to grow them, make a hole with your finger and drop a few seeds and then cover them up with soil. Remember that the harvesting time depends on the type of pepper seeds you planted. For sweet peppers it’s usually 60 – 90 days and 150 days for hot peppers. Regrowing tomatoes is very much like peppers. You have to keep the seeds you usually get rid of. It’s very important you rinse them and let them dry completely. You can start by letting the seeds grow in a pot and after they’re a few inches tall you can transplant them outside. Tomatoes require a good amount of sunlight and they should be watered a few times a week. Like what you see? Please share this on Pinterest. A lot of people like growing cilantro because they like the cut and come again method, which basically means that they always have cilantro. All it takes is to cut a few pieces of stem and to put them in a water jar. Once the roots start growing, you can transplant them to a small pot (6 inches). This way you can always have cilantro growing! Make sure you place the pot in the sun when the seeds are in the jar with water. Hope this helped you learn about how you can regrow vegetables with scraps most throw away. When it comes to planting outside, there are some vegetables you can’t pair together so have a look at this article: 8 Pairs of Vegetables That You Should Never Plant Together.